The Chatelaine's Keys » Blog Archive » Oh, the Cuteness! The Cuteness! No-drama Obama has nothing on No-drama Mina, who calmly gave us triplet doelings last night with no muss or fuss. Yes, that’s three little girls from her over-achieverness. 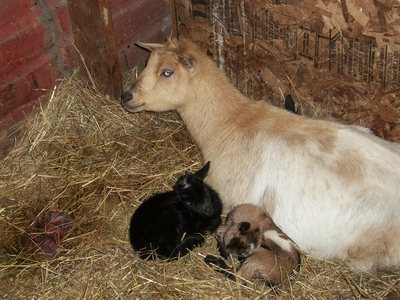 And she politely waited until we were done with dinner, and by the time we realized she was in labor, she had delivered three goats and had them all up and nursing. All in all, an incredibly auspicious beginning to our kidding season and just one more reminder of Mina’s basic awesomeness. OH!!! They are adorable! And Mama Goat looks so proud and wise. So, so cute – I want some, I want some. Can’t find any mini milkers in Australia – may have to import for myself. 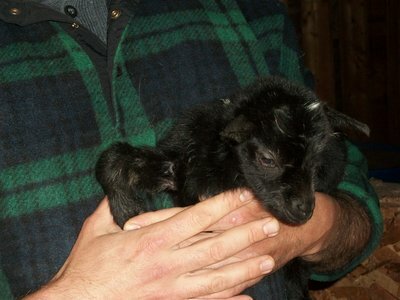 Oh, this isn’t helping my severe case of goat envy. Do you think Cordelia could be mailed to the UK with an egg sandwich and a cigarette carton of milk a la Flat Stanley? Oh yes, they are most definitely the cutest ever!!! Yay!!! Thank you for sharing these lovely photos of Mina’s family! What a lovely reminder of what spring is all about. This is indeed what spring is all about. 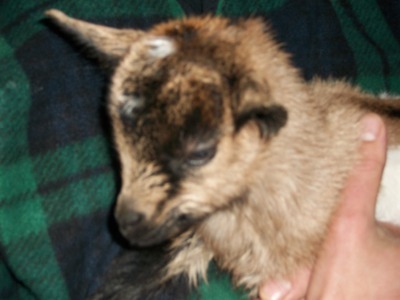 I’ve always found goats charming, but baby goats — squeee!!! Ms. Astyk: Concerning energy, if you release trapped energy from atoms or from burning fossil fuels, it stays in our biosphere Earth as it can not escape. So GW/CC will be worsening. We have to go carbon and energy negative, and that can be done by making our massive ever-expanding messes of organic wastes into a resource by using pyrolysis on them. BUT the biggest problem facing humankind is that those wastes are presently getting loaded with more toxics, germs and drugs that are escaping to pollute humankind off Earth. I can send you more details about how to make those waste messes in a resource to decrease GW/CC and the polluting of Earth. Humankind will be overwhelmed by those wastes in 10 years or so if we don’t wake up to take action to make them a resource. Cute little goats I want one! 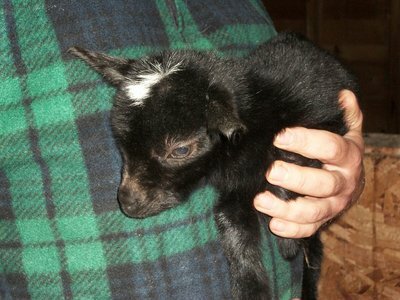 This post on “how to keep goats” reads well; of course I have no way to judge the accuracy of the information. Adapting in Place Class in July! Sandra on Adapting in Place Class in July! Paul Handover on Adapting in Place Class in July! Jenny on Independence Days Challenge is Back!!! Roy on Oh, the Cuteness! The Cuteness!